Making a giant bowl of veggies has become a nearly weekly ritual. I’ve nearly perfected the art – it takes just the right vegetable combo, proper blanching, and a bit of creativity – but lately I’ve managed to turn my big bowl of vegetables into several different meals, and I thought it was time to finally share. Here we go. 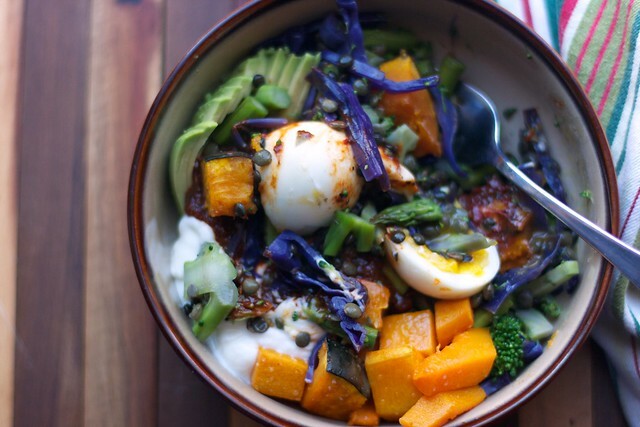 Day 1: Make the veg and eat a simple bowl mixed veg with harissa and yogurt. Day 2: Creamy coconut soup and top with mixed veg. Day 3: Miso soba noodles with mixed veggies. 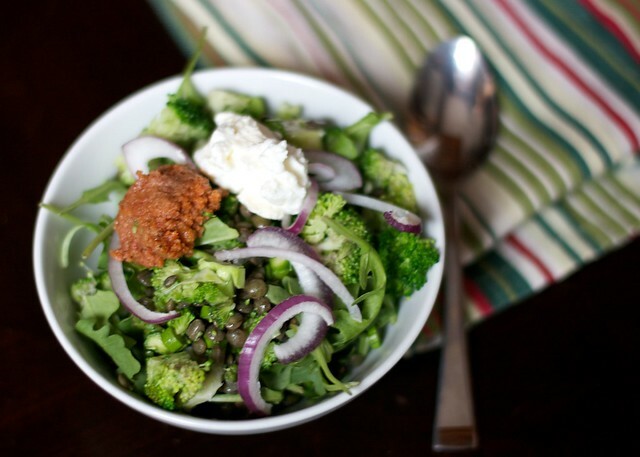 Day 4: Cold kale-veggie salad with coconut-lime dressing. Day 5: Tacos topped with mixed veggie slaw. On day 1, I like to keep it simple. 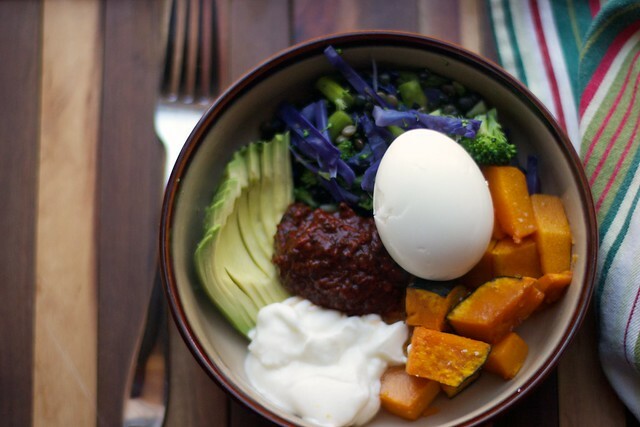 After all, I just went through all the work of chopping and blanching and roasting, so I generally throw the veggies in a big bowl with some harissa, yogurt, and a soft-boiled egg. If I have a decent avocado, that will go in the mix as well. The harissa here is homemade, and I’ll include a recipe below, but you can also buy jars of harissa at the store. 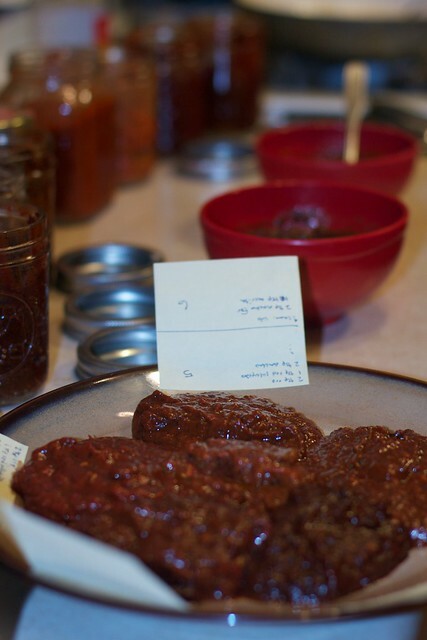 Making the harissa was a process as well, since I bought seven different peppers, prepped and processed them each separately, and then mixed then in small quantities until I found the perfect recipe. I actually recommend you do the same because a) it was a fun experiment and b) your palate is likely different than mine. Eric ended up preferring a different recipe than I did, but they both had one thing in common: fresh roasted red pepper. Most recipes for harissa only call for dried red chiles, but the fresh red peppers add a sweetness that works well to counter the bitterness of the dried chiles. As for the veggies, you can get creative with it, but the broccoli in my opinion is not optional. Quickly blanched, it just works. The asparagus in this bowl was on sale, which is why it is here, but I would say a good base is always squash, broccoli, and red cabbage. This trio has the perfect texture and color to make it all look so entirely appetizing. Add to that lentils and any other veg that looks good/is on sale. To save on dishes, I usually use two pots and cook everything in series. But, by all means, if you have 4 pots and you want to wash them all when you’re done, do it all at once! Otherwise, bring a pot of salted water to a boil. Once boiling, put the broccoli in for 30 seconds to 1 minute, MAX. Immediately drain the broccoli (you can reserve the liquid to blanch the cabbage if you want) and place it in an ice bath. Follow the same procedure to blanch the cabbage, though the cabbage can cook in the water for 1-2 minutes. Meanwhile, pour the black lentils in a pot with 1 cup of water. Bring to a boil then reduce to a low simmer until all the water is gone. Put the lentils in a big bowl and reuse the pot to cook the green lentils. While all the above is happening, roast the squash. For butternut squash, peel the skin off, but for many other types you can and should leave the skin on. Toss the cubes in olive oil and salt and pepper. For butternut or buttercup squash cut into 1-inch cubes, I usually roast them for 25 minutes at 400 degrees. Other squash might take more or less time. Just check them and pull them out when tender. When everything is finished cooking, mix it all together in a big bowl. Taste it and season as necessary. 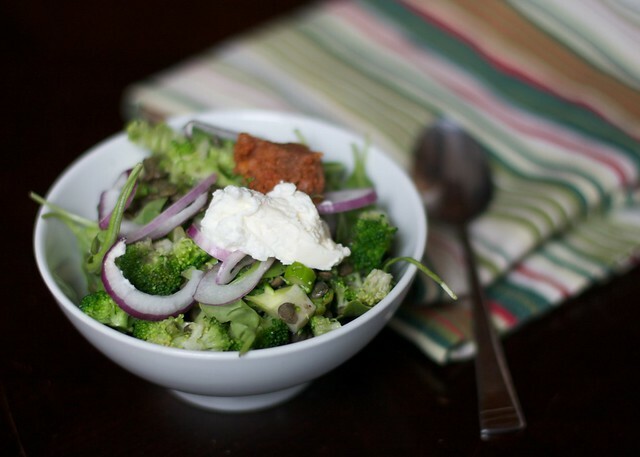 This big bowl is now the vegetable base for your week’s worth of meals. To make a soft-boiled egg, I place a raw egg in room-temperate water (from the tap) and turn on the burner. Once the water comes to a rolling boil, I set a timer for 2 minutes. After 2 minutes, I pull the egg out and run it under cold water until it is cool enough to peel. This timing makes the whites nice and solid and the yolk still runny, but this could vary a lot based on altitude, so play around with it. For example, in Nairobi, I boil my eggs for 5 minutes instead of 2. 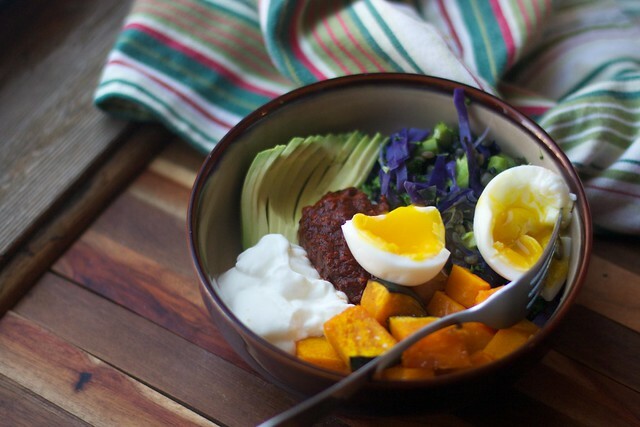 Layer everything in a bowl, take a picture because it’s pretty, and then mix it all around. Eat. 1) In a dry skillet, toast the dried chiles one batch at a time. Toast them over medium heat until fragrant but be careful not to burn them. Remove the stems and deseed the chiles as best you can. Keep the different varieties in separate bowls and label them if you need to. 2) Roast the fresh red pepper and red jalapeño. Place the red peppers under a broiler until the skin turns black. Remove them and allow to cool until you can peel the charred skin off. Roast the red jalapeños under a broiler, but not charred. Pull out and remove the stems. I kept the seeds for spice, but you can also remove them. 3) In a food processor, process the chiles. For the dried, toasted chiles, pour some water in until the peppers become a paste. Pour each paste into a jar, label it, and set aside. The roasted red peppers should process easily without water, but the red jalapeños will also need a bit of water and/or oil to form a paste. 4) Make garlic oil. 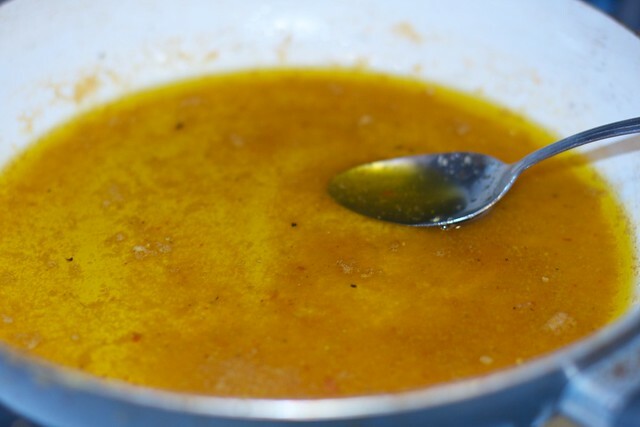 In the food processer, add 5-6 cloves of garlic and process with 3/4 cups olive oil. Pour the mixture into a pan and heat until fragrant over medium heat. 5) Taste all the chile pastes separately to get a feel for the flavor of each one. Morita chiles, for example, have a very smoky flavor, while ancho chiles are a bit sweet. 6) Start mixing and matching. Each batch should have a mix of pepper pastes in addition to salt, garlic oil, and cumin. In general, per 5 teaspoons of pepper paste, I used 1/4 teaspoon of cumin and 1 tablespoon of garlic oil. Play around with it until you find a combo you like. Eric’s is kind of a mish mash of everything. Rather than providing better measurements, I would simply buy a bunch of different peppers, process them according to the directions above, and mix them all together. The exact quantity is probably not as important as imparting a bit of each chile into the final harissa. Three weeks guys. Three. Weeks. That’s when the semester is officially over! It’s been a good run, but I’m pretty ready to be done. And I have a pretty rad summer lined up, so that just makes everything better! You guessed it – I’ll be traveling. I’m headed back to Nairobi this summer to work with KDI again, this time with the help of AECOM. Eric will once again have a summer filled with frozen turkey burgers and weekend nights on which he stays up past 9pm. Lucky guy! This time around, I have one month for work, and one month for fun and travel through Kenya and Uganda. And when I get back – besides looking for a job – we’ll hopefully be traveling some more. Eric and I are about two weeks away from getting our hands on a Southwest Companion Pass, so we have lots of weekend trips planned. Portland, Utah, Atlanta, Charleston, Puerto Rico, Key West, Philly, and Carlsbad Caverns are all on the list. When the Air Trans/Southwest merger takes full effect, we’ll be adding Mexico City. Sooo many places. Since we have the companion pass until the end of 2014, we’ll hopefully be able to squeeze all these and more into our schedule! I’ve been making veggie bowls a lot lately. And salad bowls. Basically just a lot of big bowls of vegetables. The varieties are endless, but I really liked this one that I concocted the other day using walnut and sun-dried tomato pesto courtesy of Licking the Plate. I like all my veggies chopped into small, bite-sized pieces. Makes it easier to dig into with a spoon. The day before, empty a large container of plain yogurt into a cheese cloth and let strain for 24 hours. Refrigerate and set aside. Put the lentils in a sauce pan with 2 cups of water. Bring water to a boil and then reduce heat to a simmer. Cook uncovered for approximately 20 minutes, or until tender. If there is any liquid still in the pan, strain the lentils and stir with salt to taste. Meanwhile, bring another pot of water to a boil. Add the broccoli and asparagus and cook for one minute. Remove from heat and strain, immediately putting the veggies into a cold water bath. Set aside. 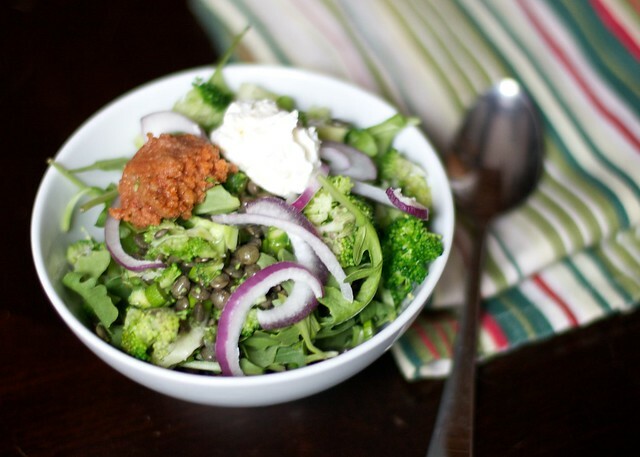 When all the prep has been completed, combine everything into a bowl – the asparagus and broccoli, the lentils, arugula, and onions. Top with the pesto and yogurt, Add a bit more salt to taste. *There are many variations you could take with this recipe. Regular pesto would work well, as would harissa. Feeling lazy? Just drizzle olive oil and balsamic over the mixture. Want some grains? Add farro or buckwheat. Don’t want to take the time to strain the yogurt? Fine, just dollop regular plain yogurt on top. Try roasting the veggies instead of blanching them. Top it with a poached or soft-boiled egg. Add some olives. Sprinkle on some roasted kale. Once the farmer’s market opens, I’ll be making this with whatever is available there. Yum.